The Liverpool2 shipping terminal was opened on Friday (4 November) by Dr Liam Fox MP, secretary of state for international trade. Operators Peel Ports said the new port was one of the UK’s largest private sector infrastructure projects and was developed at a cost of £400m in response to changing trading patterns and shipping industry trends towards the use of ‘mega’ ocean-going container ships. The company said it will provide an ocean gateway for UK importers and exporters ‘with road, rail and canal connections linking directly to the heart of the UK mainland, accessing a catchment of over 35 million people, almost 58% of the UK’s population’. This catchment claim is based on an assessment that 58% of the UK’s population is closer to Liverpool than its competitor ports in the South -Felixstowe, London Gateway and Southampton. 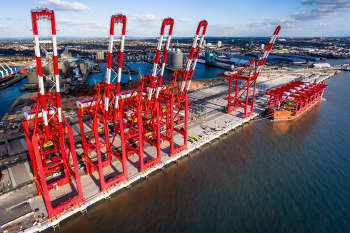 Peel Ports said that Liverpool, which is the only major container port in the north or west of the UK, currently has around 8% of the container market in the UK - expected to rise to between 15% and 20% – and is already the country’s biggest transatlantic port, with a 45% market share.